Nature – River Mangrove Are The Life Of Climate.IS. So the recent apparent rejection of the elites in both America and Britain is surely aimed at me, as much as anyone. Whatever we might think about the decision by the British electorate toreject membership of the European Union and by the American public to embrace Donald Trump as their next president, there is no doubt in the minds of commentators that this was a cry of anger by people who felt they had been abandoned by their leaders. The National Committee to Protect Oil, Gas, Mineral Resources and Power, Ports has announced a worldwide protest programme on Jan 7 against the Rampal power plant in an attempt to save the mangrove forest, the Sundarbans. The committee announced the protests at a rally at the Central Shaheed Minar on Saturday organised to demand cancellation of the Rampal power plant project at the vicinity of the forest. Its Member Secretary Professor Anu Muhammad said at the Shaheed Minar gathering that processions and rallies will be held across Bangladesh on Dec 26 to demand immediate cessation of all activities relating to Rampal power plant as it is ‘harmful’ for the Sundarbans.”A Protest Day will be observed worldwide on Jan 7,” he added. He, however, did not elaborate whether rallies and processions would be organised abroad by respective chapters of his organisation.The other anti-Rampal programmes include rallies in divisional and district headquarters on Jan 14.The committee will also present a low-cost, sustainable and environment-friendly ‘mega-plan’ as an alternative to the Rampal project on that day.If the demand is not met within that day, the committee will enforce a half-day general strike in Dhaka City on Jan 26 and announce more protests, Anu Muhammad said.The Jahangirnagar University economics professor called the protesters for getting inspiration from Liberation War martyrs ahead of the Martyred Intellectuals Day and Victory Day.”Make songs, plays, documentaries to save the Sundarbans. Take protest programmes like rally, procession, and human-chain,” he urged.A procession was brought out from the Shaheed Minar after the rally which paraded the city streets.The oil-gas committee had earlier organised a ‘Padjatra’, or march towards the Sundarbans, claiming that the project initiated jointly by India and Bangladesh to set up the coal-fired plant would destroy the mangrove forest.The government and the project authorities have been denying the claim, saying the environmental damage will to be kept at the minimum level.Anu Muhammad said at the rally that his committee has been protesting against the plant for five years.”Had the government cared about logic, scientific data, people’s opinions and country’s future, then it would have stopped the project activities which are destructive for the Sundarbans,” he said.The economics professor said several researches have showed the ‘harmful’ sides of the project.”No specialist, except those taking benefits from the Rampal project, is speaking in favour of the project. The government is knowingly feeding the people poison,” he said.He claimed the extinction of the Sundarbans will directly affect 3.5 million people and leave 50 million others unprotected from natural calamities.He alleged the project aims to award India businesses.Dhaka University English department Professor Emeritus Serjaul Islam Choudhury said there was ‘no doubt’ that the extinction of the Sundarbans will ‘destroy entire Bangladesh’.”Only 1 percent of the population who have sent their children abroad are doing this (building the plant),” he said.Communist Party of Bangladesh (CPB) President Mujahidul Islam Selim demanded a public debate on the project.”If we the communists get the power, the plant will be relocated from Rampal,” he said.Columnist Syed Abul Maksud called for a referendum to know the people’s opinion on the issue.BD Rahmatullah, a former director general of state-run Power Cell, said it would be possible to generate double the capacity of Rampal plant with renewable energy.Bangladesher Samajtantrik Dal (BaSaD) General Secretary Khalequzzman and Dhaka University economics Professor MM Akash, among others, spoke at the rally. Some countries on climate change hit-list.All the countries are Low Income &Middle Incomeing countries.The people are faceing every moment,how the climate changing.But they are not helping by the cop properly.But,the cop conference is spending a lot of money every year.We think,do not spend a lot of money.Give the advice and money to climate change hit-list countries.Organized a small conference every year. WE are doing something our own money,idea,advice. World leaders are preparing to gather in Morocco to build on a year of momentous action. Nick Visser Reporter, The Paris climate agreement, the most comprehensive international plan to combat the worst effects of rising temperatures, went into effect on Nov. 4. Now, thousands of officials are preparing to meet in Marrakech, Morocco, for the 22nd Conference of the Parties, with the hopes of figuring out many of the specifics regarding putting that deal into action ― including how to pay for the necessary changes and speed up the transition away from planet-warming fossil fuels. But as past meetings have shown, failure can hover around the corner as countries struggle to agree on how ambitious emissions cuts can be. And a U.S. election led by two candidates with vastly different views on environmental policy could affect America’s place in any future negotiations. How Do We Live Up To Paris? The Marrakech meeting will focus on how to implement the Paris agreement now that it’s been ratified into force. While last year’s deal put countries on record with their individual commitments for cutting emissions, many still need to determine how they will implement those plans. Alden Meyer, director of strategy and policy at the Union for Concerned Scientists, a science advocacy group based in the U.S., said the conversation in Morocco will largely focus on solidifying nations’ efforts by a deadline set for 2018. And the challenge is vast. Under the Paris framework, each country’s goals are voluntary, and a country that fails to adhere to promised emissions cuts won’t face any repercussions. But many countries, including the China and the U.S., have already announced plans curb emissions. There has also been a recent international agreement on phasing out the use of a heat-trapping refrigerant called hydrofluorocarbons, which is seen as progress toward meeting the goals of the Paris deal. Meyer said the Marrakech meeting will seek to build on that momentum, aiming to keep global warming well below the 2-degree Celsius limit laid out in Paris ― the level scientists say we must stay beneath to avoid the worst effects of climate change. Small, low-lying nations like the Marshall Islands often bear the brunt of climate change’s effects, but don’t emit nearly as much greenhouse gas emissions as richer countries. The transition to a low- and no-carbon economy will be expensive, requiring a reallocation of up to $90 trillion in investments toward renewable infrastructure, according to a recent report from the Global Commission on the Economy and Climate. Much of that burden is expected to fall on the shoulders of rich nations like the U.S. and the European Union, and rapidly developing nations like China ― which also happen to be the world’s biggest polluters. The Paris agreement includes a pledge to jointly raise $100 billion a year by 2020 to help developing nations cope with climate change. But the private sector and local governments around the world are also expected to play a big role in any transition to a low-carbon future, according to Andrew Steer, CEO of the World Resources Institute, a Washington-based environmental organization. But both rich and developing nations ― namely in Africa and Southeast Asia, which are expected to grow quickly as more than a billion people still lack basic energy ― will need to participate in the conversation about raising and spending that money. Sustainable transit, land and forest protection, investment in renewables and a carbon tax are all expected to be discussed in Marrakech, both within the official negotiations and in the hundreds of side events that aim to increase the ambition laid out in Paris. What Will It Mean For The U.S.? But the U.S. election is taking place on the second day of the climate summit, and the two major-party candidates disagree on the country’s role in that fight: Democratic nominee Hillary Clinton is an ardent supporter of emissions cuts, but Republican nominee Donald Trump denies that climate change is even happeningand has threatened to leave the Paris deal if he wins. While Morton noted the “candidates have very different views on climate,” he said in recent years there has been “a recognized inevitability of the transition to a low-carbon economy.” The world is moving forward, with or without the U.S. Medicinal plants free service, running..
Remembering the old days of the past, tree nuts Mohammed Ali, has been met with a lack of real life extreme. The lack of arable land next to his house for the family members of wage dumutho made bread. Sometimes families have Ardhahare people were starving. But he let her have changed due to ausudhi tree. When you take money from someone who is not sick for medicinal plants. No trees for any disease, but how he can help with information on what to eat. Khandaker Mohammad Ali, 16 years old when he was diagnosed with complex diseases. The lack of proper treatment due to his father’s family, she became increasingly ill. Her family gave up hope of being fit. At one point, the mother tried herbal doctor from a nearby village, was cured with treatment. Since then, his belief in the benefits of trees friend. Medicinal trees, a lot of power. He promised to save their lives, if not medicinal plant garden. He believed, with medicinal plants can be used to benefit the people on the one hand, on the other hand will earn from the sale. From the past, the planning side of the house has a nursery and medicinal plant garden. Now local people are benefiting from the garden of medicinal plants on the one hand, on the other hand medicinal plants and fruit trees are sold in the last 34 years, you’re family. The 76-year-old. That’s why his life after being infected with the disease kaisare trees make it out alive. As a result, the emphasis of the tree. As scientists claim that the snows of Kilimanjaro are disappearing, where else in the world are the effects of climate change being most keenly felt? People living in the flood-prone delta nation are feeling the full force of climate change. Frequent flooding wipes out crops, spreads disease and destroys homes. The UK government’s Department for International Development (DFID) has pledged £75m over the next five years to help the people of Bangladesh cope with the impact of global warming. Rising temperatures are causing the Sahara Desert to expand, eating into the farmland on the edge of the wastelands and causing immense pressure for food. Rainfall in the northern regions of Sudan, including war-torn Darfur, is down by 30 per cent over the past 40 years, with the Sahara advancing by well over a mile every year. Scientists believe that Darfur is an example of climate change conflict, with tribal disputes being exacerbated by increased demand for scarce fertile land and water reserves. Warmer seas are believed to be bolstering the power of hurricanes, which rip through the Caribbean regions with increasing frequency and savagery. Hurricane Katrina swept through New Orleans in 2005, killing 1,600 people and causing an estimated $40 billion of damages, while research published in this summer in the science journal Naturesuggests that hurricanes in the Atlantic are more frequent than at any time in the last 1,000 years. Australia’s arid climate means it has always been prone to forest fires, but scientists believe the ferocity of recent blazes is linked to climate change. The temperature has been rising steadily since the 1950s and this is increasing the intensity and frequency of outbreaks. In one of the world’s last wildernesses, global warming is causing profound changes to the lives of its people. Winters that used to reach -50 degrees are now a comparatively mild -30, which is causing the permafrost to melt. Arctic houses are subsiding, and the nomadic people of the tundra find that their annual migrations are disrupted by unseasonably warm temperatures or unexpected snow falls. 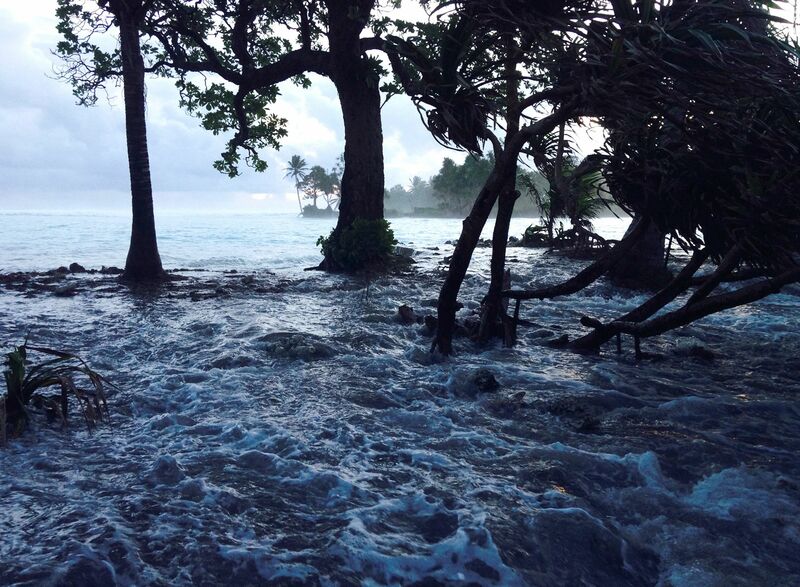 The low-lying Pacific islands of Tuvalu face the very real threat that they could be wiped out by climate change. The highest point of the islands reaches only four and a half metres above sea level, and the coral upon which the islands are built is seeping sea water, making much of the land too salty to farm. Climatologists believe that Australia is experiencing “accelerated climate change”, which puts the vast Great Barrier Reef at severe risk. Rising ocean temperatures cause bleaching of the coral, when the plants expel the tiny animals living inside them and turning into colourless calcium skeletons. The much-loved European winter playground is increasingly under threat from warmer temperatures, disrupting the snowfall and causing the ice to melt. Scientists from the Convention for the Protection of the Alpspublished a report in June this year claiming that the Alps were gradually being split in two, with the southern regions receiving 10 per cent less precipitation over the past 100 years and the northern regions facing flooding and landslides. Although climate change in Britain may not be as keenly felt as in Bangladesh or Tuvalu, scientists still maintain its effects are noticable. The National Trust warns of threats to historic properties and estates from flooding and storm surges, and highlights the worrying loss of wildlife habitats. According to the South African Development Community, which comprises 15 countries, 23 million people require urgent humanitarian assistance and a further 13 million are food insecure following the strongest El Niño event recorded. Food shortages are expected to peak between October, when supplies will run lowest, and March, when the next harvest is due, so the number of people in extreme need is expected to rise significantly if insufficient assistance is given. The US has pledged $127m (£97m), lifting its contribution to the region to about $300m. Britain has delivered $250m to Africa since July 2015 as part of its El Niño response, and the Netherlands, Switzerland and Italy last week announced pledges totalling $22m. But the gap between funds needed and pledged is thought to have risen to more than $4bn. According to the UN Office for the Coordination of Humanitarian Affairs, $6bn has been requested by the governments of the 60-odd countries affected by El Niño but less than $2bn has been pledged. “Mobilising humanitarian assistance will be critical to save lives and reduce suffering. Our additional contribution will help meet growing needs by providing emergency food assistance, nutrition and health support, access to safe drinking water, and seeds ahead of the upcoming planting season to promote agricultural recovery,” said a USAid spokesman. “It has been clear for months that this drought is having a devastating impact on the southern Africa region, and we know things could get even worse. People are struggling now. They have watched their crops wither and their animals starve to death. Even in the best-case scenario the next major harvest is not expected until early next year,” said Rebecca Sutton, Oxfam’s El Niño campaign manager. “The full force of the emergency will be felt over the coming months,” said Save the Children’s east and southern Africa regional director, David Wright. “Harvests will continue to fail; families will run out of essentials as their livelihoods dry up or are washed away; and children forced from their homes will leave healthcare, security and loved ones behind. The UK’s international development minister James Wharton said, “Widespread drought means millions of people across Africa are being forced to go without vital food and clean water, while others are being displaced by severe flooding, losing their homes and their livelihoods. The UN has warned that humanitarian disasters are to be expected with climate change. “This is a human-induced aggravation of a traditional weather pattern. We’re into a new normal where it is no longer El Niño – it is El Niño affected by climate change,” said Mary Robinson, UN special envoy on El Niño and climate.